Human papillomavirus (HPV) and cytomegalovirus (CMV) are viral pathogens affecting individuals of all ages. HPV causes serious sexually transmitted diseases (STDs), while CMV is an opportunistic pathogen affecting immunocompromised individuals such as HIV patients. The global market for HPV and CMV therapeutics is expected to experience a surge due to various macro and micro economic factors. More than 100 strains of HPV have been identified till date, of which certain types are known to cause warts or papillomas that progress to benign or malignant cancers. HPV infections are common in adolescents and young adults with highest prevalence in adolescent females. According to CDC, in 2012, an estimated 20 million persons were infected that year in the U.S., and an estimated 6.2 million new HPV infections were expected to occur annually. The human papillomavirus therapeutics market includes immunomodulators, keratolytic agents, anti-neoplastic agents and sinecatechins. Immunomodulators account for the largest share of the global HPV therapeutics market, while the sinecatechins segment is expected to be the fastest growing market segment. Genital warts is the leading application segment in HPV therapeutics market in terms of revenue generation, due to higher number of HPV strains leading to genital warts which are easily transmitted through sexual contact. Dry therapeutic pipeline and serious threat from substitutes such as cryotherapy and laser therapy have made the market less attractive. Asia Pacific and South America are observed to be the most attractive markets due to developing healthcare infrastructure, high disposable income, and cultural shifts and tourism augmenting the prevalence of STDs. The global HPV therapeutics market was valued at USD 1,402.3 million in 2012 and is expected to reach USD 2,346.5 million by 2020, growing at a CAGR of 7.7% from 2014 to 2020. Cytomegalovirus infections are usually asymptomatic and do not need therapeutic treatment for immunocompetent patients. However, the virus causes inflammation of the eye called as retinitis in patients with weak immune system. Thus, prevalence of symptomatic CMV infections is common in HIV and transplant patients. Ganciclovir and valganciclovir are the two first line drugs prescribed for treating CMV infections. These account for over 85% revenue share of the global CMV therapeutics market. High seroprevalence of up to 95% in low and middle income countries has posed CMV infection threat to a large population. Furthermore, high rate of resistance for ganciclovir and valganciclovir in HIV patients is also a major concern in these countries. Anticipating launch of brincidofovir in 2016 and letermovir in 2018, the CMV therapeutics market is expected to grow rapidly in the near future. The global CMV therapeutics market was valued at USD 870.1 million in 2012 and is expected to reach USD 922.8 million by 2020, growing at a CAGR of 1.49 % from 2014 to 2020. Valeant Pharmaceuticals dominates the global HPV therapeutics market with more than 70% market share while Roche AG leads the CMV therapeutics market with over 85% share. Other key players in the HPV and CMV therapeutics market include Fougera Pharmaceuticals, Perrigo Company plc, Clinigen Group plc and Fresenius Kabi USA. 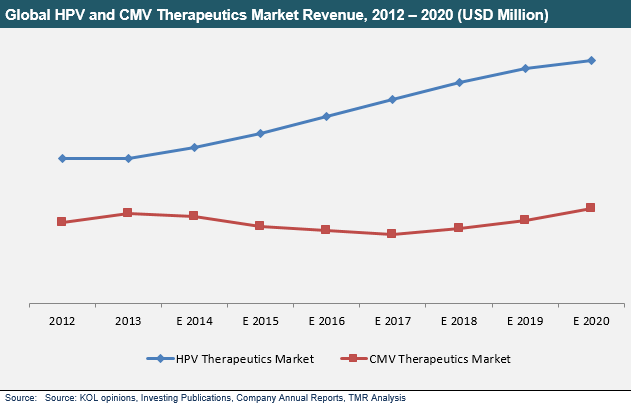 Human papillomavirus (HPV) and Cytomegalovirus (CMV) therapeutics market report studies current as well as future prospects of the market on a global scale. The global market for HPV therapeutics is segmented by drug class and applications. Various drug classes applied against HPV infections are immunomodulators, keratolytic agents, anti-neoplastic agents, and sinecatechins. The HPV therapeutics market is studied by application segments which include genital warts, genital cancers, epidermodysplasia verriformis, oral papillomas, and others (oropharyngeal cancer, laryngeal papillomatosis and others). The global HPV therapeutics market has been extensively analyzed on the basis of the effectiveness and sales revenue of major drug classes as well as geographic prevalence of various HPV infections. The global CMV therapeutics market is segmented by drugs and applications. The major drugs prescribed for the treatment of CMV infections are ganciclovir, valganciclovir, foscarnet, and cidofovir. The CMV therapeutics treatment is applied against various CMV infections causing retinitis, pneumonia, gastrointestinal ulcers, encephalitis and others (mouth ulcers, pharyngitis and others). Geographically, the HPV and CMV therapeutics market has been categorized into five regions namely, North America, Europe, South America, Asia Pacific, and Rest of the World (ROW). The market size and forecast in terms of USD million for each of these segments has been provided for the period 2012 to 2020, considering 2012 and 2013 as base years. The HPV and CMV therapeutics market report also provides compounded annual growth rate (CAGR %) for each market segment for the forecast period 2014 to 2020. The report also provides pipeline analysis for HPV and CMV therapeutics market, which includes sales forecast for drug candidates currently under phase III clinical trials, and also mentions other candidates in phase I and phase II trials. The research study explains the competitive scenario in the HPV and CMV therapeutics market through Porter’s Five Forces Analysis. A detailed analysis of various macro as well as micro economic factors driving as well as restraining the growth of this market, in addition to future opportunities, is provided in the market overview section of the report. The report also provides market attractiveness analysis and value chain analysis of the global HPV and CMV therapeutics market. Market share analysis for both HPV and CMV therapeutics market has been included. Furthermore, pricing analysis of therapeutic drugs and costs associated with treatment is also studied in the global HPV and CMV therapeutics market report. A list of recommendations has been provided to help players establish a strong presence in the market and increase their share. The report also profiles major players in the HPV and CMV therapeutics market on the basis of various attributes such as company overview, financial overview, product portfolio, business strategies and recent developments. Mergers, acquisitions, regulatory approvals and other events have been explained in the company profiles section. Key players profiled in the report include AbbVie, Inc., Actavis plc, Clinigen Group plc, Merck & Co., Inc., Perrigo Company plc, Roche Holdings AG and Valeant Pharmaceuticals International, Inc. The research methodology was based on primary as well as secondary research. Interviews and discussions with a wide range of key industry participants and opinion leaders revealed the real time market scenario. This primary research represented the bulk of our research efforts, which was further supplemented by extensive secondary research. A bottom-up approach was adopted to arrive at global market shares for 2012 and 2013; while an impact based analysis model was adopted to forecast revenue for each market segment. A review of key players’ product literature, annual reports, and press releases supported the market forecast analysis. The 117 pages global HPV and CMV therapeutics market report describes various market dynamics in 51 figures and charts and 16 tables.